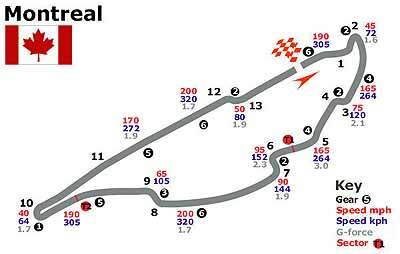 The first Grand Prix of the 2007 season across the Atlantic will be run in Montreal at the Gilles Villeneuve Circuit, constructed on a man-made island which had been used in the 1967 Expo. Originally named the Ile Notre Dame circuit, the circuit was renamed in Villeneuve’s memory after his death in 1982. The location is one of the loveliest in Formula One since the narrow track threads its way through lakes and parkland. It is a narrow, medium-fast, 2.75 mile circuit with 13 corners. Some corners were eased for 1979, a new corner before the pits was added in 1991 and a chicane was added in 1994. And, it is possible to pass, as opposed to Monaco! With Alonso and Hamilton on top of the table as individuals, and McLaren Mercedes leading the manufacturer’s championship, there will be much at stake this weekend. It could be an interesting race. By my reckoning it will be starting at midnight (Sunday night or Monday morning, take your pick). It is also reported from usually reliable sources that Toyota are finally (and not before time) tired of Ralf Schumacher, one of the highest paid drivers on the current grid. He lags well behind Jarno Trulli, both in points so far, and in qualifying. The word is that Ralf has been told to shape up or ship out. He has the two overseas legs in Canada and the USA to prove he should be kept. Quite some incentive bonus scheme! It is also official that the FIA has dropped the mooted charges against McLaren for “team orders” at Monaco, telling (and arranging) Lewis Hamilton to come second. It really is time that the FIA dropped this legislative nonsense. Team orders have always been a part of motor racing, at all levels. Do you really want to see your two car team take each other out, while comfortable leading? Come off it! All this rubbish began only recently when Ferrari told their number two to let number one through. Loud screams all round. Fangio won some of his world championships following team orders. No screams. Ford won at Le Mans using team orders. No screams. I’m sorry, but if you have a team, then you make sure your team entries support each other, not disadvantage each other. You don’t need rocket science to work that out. But apparently, the FIA needs it. Last week I asked which car company built their test track on the roof of the factory? The answer was the FIAT factory at Lingotto in Turin, in which regular contestant Peter Eade got in first. So to this week. One of the most enduring engine designs came out just after WW I and stayed in production until 1963. It was a six cylinder, wet-liner engine of just under 2 liters and had a single overhead camshaft. Originally it produced a whopping 35 bhp, but by the time it was phased out it was giving more than 100 bhp. Clue: the last car this engine went into, eventually was given a V8. For the Automania FREE beer this week, be the first correct answer to email [email protected] chiangmai-mail.com Good luck! An enterprising company in the US, called N2A (No 2 Alike) is building this amazing “Chevvy”, called the 789. Costs a bundle, even in the US ($135,000 - and up, depending on options), but would have to be one of the ultimate head-turners. The production run is reputedly only 100 vehicles. It sits on a Corvette C6 chassis, and the front is styled like a ‘57 Chevy, the side like a ‘58, and the rear like a ‘59. Hence the designation 789. It has the “hooded eyes” and chrome grille bar of a ‘57 Bel Air, a mid-section and tri-toned interior that is reminiscent of a ‘58 Impala and the “bird in flight” rear tailfins of a ‘59. These three vehicles are all instantly recognizable classics all over the world. Now as long as they have also used the suspension of the C6, it might just handle as well. A modern retro classic. Is a Corolla hybrid coming? TAccording to GoAuto in Australia, the next update of the Toyota Corolla is likely to bring one of the biggest changes in the car’s 40-year history, with the arrival of the first petrol/electric hybrid model. A Corolla hybrid is a high priority with the development team behind Toyota’s global best-seller, even if there is no firm plan yet for the car expected in 2011. Australians can definitely expect a diesel Corolla within the life of the current car, which has just hit local roads. Toyota Australia is also keen to introduce a V6 model above the new 1.8 liter four cylinder sedan and hatch. The diesel is probably coming in 2010. OK, that doesn’t really say much, but Okudaira-San has some clout in the Toyota hierarchy, and this might be a ‘toe in the water’ exercise to see if it is a popular concept. Okudaira says the biggest problem will be cutting the cost of the petrol/electric drive system so it is affordable for Corolla customers. Toyota is committed to a huge expansion of its hybrids. It is already working on batteries that are lighter and cheaper than the exotic nickel-metal-hydride units it now uses. 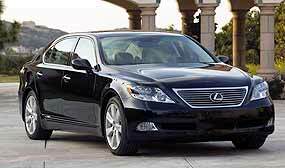 It is also working on more advanced powertrain systems taken from the exotic all-wheel-drive unit just fitted to its new luxury Lexus LS 600h flagship. Mind you, if you’ve got the money to buy one of these, do you really care about the fuel consumption? A diesel-powered Corolla is apparently much closer, even if Toyota Australia missed the cut for the introduction date to coincide with the 10th-generation car this year. An engine has been developed for Europe, where the new Corolla hatch is called Auris and aimed at much younger buyers. It could easily be picked up for local use. 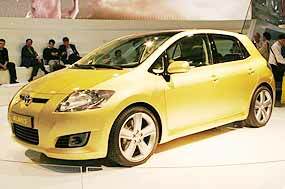 Toyota is also looking at the 2.4-liter V6 used in a Corolla-based car, the Blade, in Japan. Now that would be a pocket rocket. A V6 Bangkok taxi! Toyota makes $1,200 per car. US automakers lose money! The Harbour Report in the US tots up just how long it takes each manufacturer to make a car and how much profit (or loss) is involved. Guess what! Toyota and Honda came out best, whilst Chrysler, GM and Ford did not do well at all. So how long does it take for Toyota to build your car? And that is starting from scratch in pressing the body shell, assembling engine and transmission and then assembling the entire car. The answer is under 30 hours! Order it today and pick it up at lunch tomorrow! Toyota’s total manufacturing hours per vehicle, while leading the way among the participating companies at 29.93 HPV, was not as strong as its 2005 performance of 29.40. Honda was second at 31.63 HPV. The manufacturing productivity gap among North American automotive manufacturers continued to narrow as quality advances and more flexible labor agreements drove major improvements, according to The Harbour Report (TM) North America 2007, the annual study released by Harbour Consulting. DaimlerChrysler (and now Chrysler), Ford and General Motors still have a wider variation in capacity utilization among their assembly plants, while they continue to work on plant flexibility. By closing plants in the next two years, all three domestics should see improvement on capacity utilization. Others, such as Toyota, which had its assembly plants running between 95 percent and 108 percent of capacity, are leveraging their design, engineering and manufacturing organizations to increase flexibility and use common parts and processes. Whilst all of the above is true, the poor bottom line remains so because of the fact that the Big Three continue to make vehicles that the buying public does not want, and then have to spend big to try and coax them to buy with price cuts and incentives. On the other hand, Toyota and Honda have enough cars in their ranges to cater to the general public, no matter how quickly tastes change.